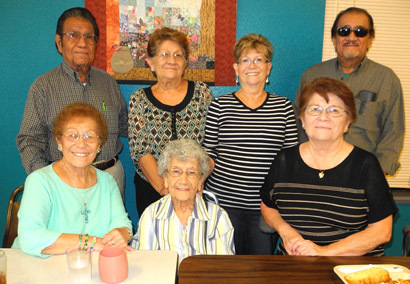 Anna Baca, seated at center, was joined by her “six senior citizens,” as she jokingly calls her children, Thursday at the Artesia MealSite for a celebration of her 101st birthday. Baca came to Artesia in 1932 with her late husband, Juan Baca, and the two began their family here, with Anna focusing on “just raising my kids to be good citizens.” All of Baca’s children were born and raised in Artesia. She currently has 11 grandchildren, 15 great-grandchildren and 14 great-great-grandchildren. Baca still lives at home, where she enjoys needlework and making tortillas for her family.